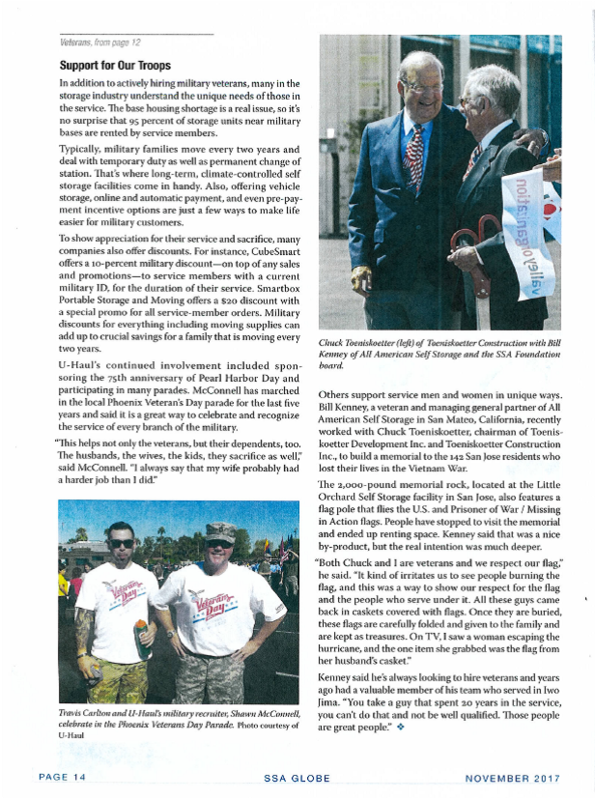 U-Haul Company’s commitment to hiring veterans, honoring veterans and supporting veteran causes is profiled prominently in the November 2017 issue of Self Storage Association’s Globe Magazine. Author Laura Fries delves into the U-Haul efforts of recruiting veterans to work for its 72-year-old organization. Furthermore, the veteran gene is part of the Company’s DNA. 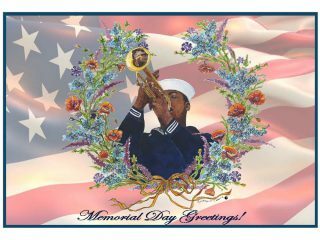 WWII Navy veteran L.S. Shoen started U-Haul along with his wife Anna Mary Carty Shoen. 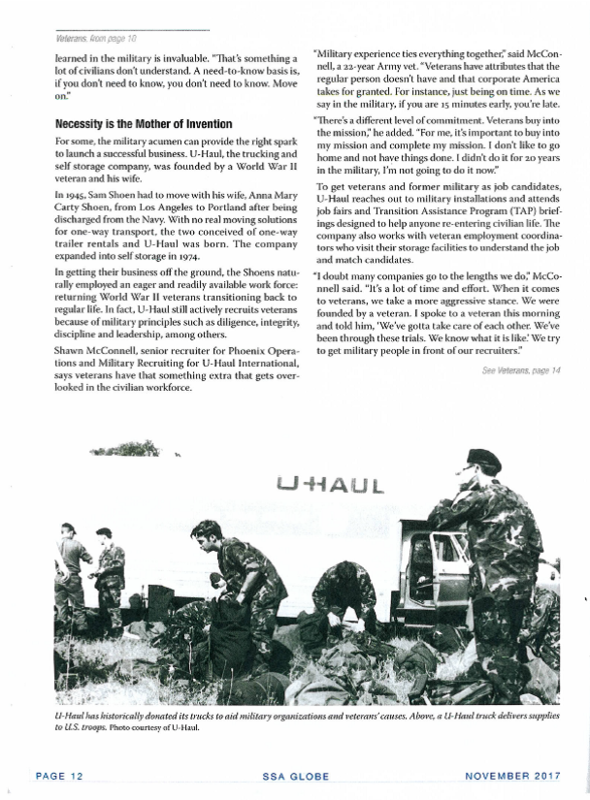 Shawn McConnell, U-Haul senior recruiter for Phoenix operations and military recruiting, speaks candidly in the article. He notes how veterans embrace the service mission and consequently contribute a great deal thanks to their team approach. “Veterans have attributes that the regular person doesn’t have and that corporate America takes for granted,” McConnell stated. “For instance, just being on time. As we say in the military, if you are 15 minutes early, you’re late. U-Haul is also a fixture in Veterans Day and Memorial Day parades. 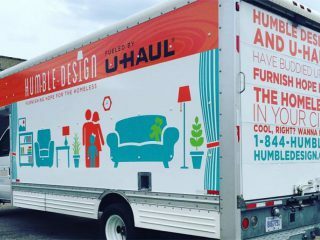 The Company works to help veterans in the community through nonprofit partners such as Humble Design Fueled by U-Haul. 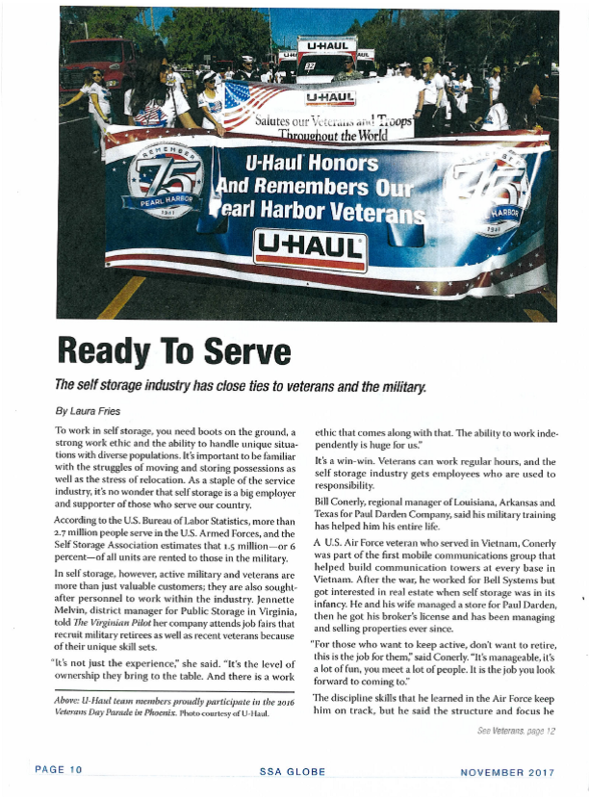 SSA’s Globe Magazine fittingly highlights the U-Haul commitment to veterans during the month when Veterans Day is observed. Please give the article a read. Nice job, Ms. Fries. Did you know U-Haul served as the Opening Gala Presenting Veterans Sponsor for the 75th anniversary Pearl Harbor Day ceremonies? It is one of many veteran causes U-Haul proudly supports.